Want to use your blog to inspire change? This episode explores how a blogger followed her passion and grew a mega following in a few short years. Join me as I interview Vani Hari, who is known online as the Food Babe. 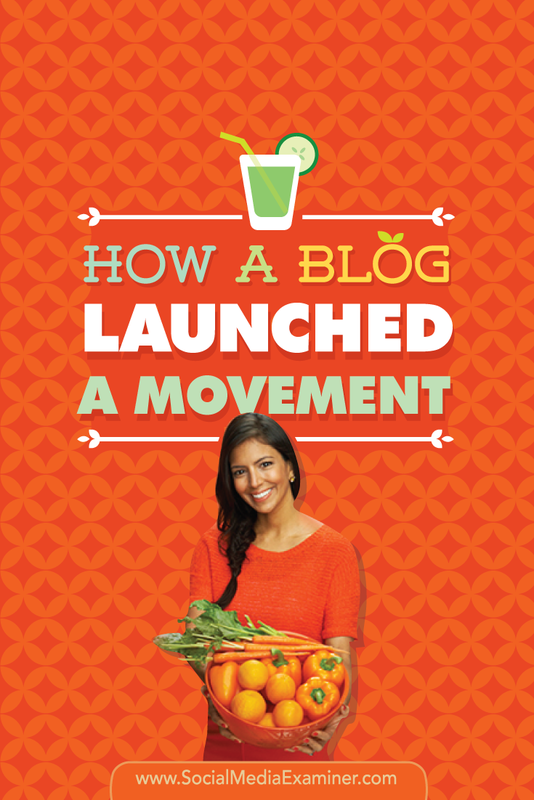 Her popular blog, FoodBabe.com, focuses on healthy eating. She’s built a large platform through articles and videos that investigate unhealthy ingredients in food. Her new book is called The Food Babe Way. In this episode Vani will share how she got started with her blog and built her following. You’ll discover how to apply Vani’s lessons and journey to your own business blog. 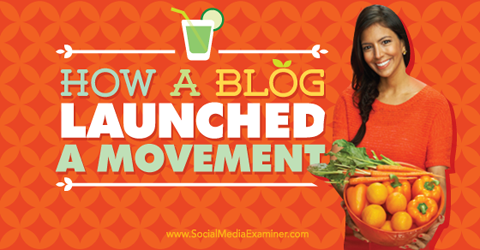 Listen as Vani Hari shares how a blog launched a movement. Vani’s parents were from India, and moved to the United States right after they married. The first thing Vani’s father introduced her mother to was a McDonald’s hamburger. Since cows are sacred in India, her mother had never eaten a hamburger before and it was a shock to her system. It turned out American food didn’t sit well with Vani’s mother, so she just made Indian food at home. However, she let Vani and her brother eat whatever they wanted. Because the siblings wanted to fit in with their neighbors and peers (Indian food looked weird and smelled funny to some of the other kids), they shunned their mother’s cooking and asked for fast food and other processed foods. As a result, Vani had a lot of health issues as a child: eczema, asthma, allergies and stomachaches. She didn’t tie them to food; she thought they were largely genetic, because her brother also had health issues. Many years later, her health issues caught up with her. Vani was working in a prestigious job for a big-six consulting firm shortly after she graduated from college. She gained over 30 pounds right away (eating catered meals brought into the office and fancy dinners out), and landed in the hospital with appendicitis. Vani didn’t look or feel well. It was a major wake-up call. The Food Babe Way by Vani Hari. After her recovery, when Vani got back to work, she started to research health and nutrition. She wanted to lose the weight and get healthy. Vani set out to learn about what she was eating; what the ingredients were, why they were in the food and why the food companies were using them. She discovered the chemicals put in food (many of which were invented in the last 50 years or so) were there just to improve the bottom line of the food industry, to figure out how to sell food cheaper by using food-like substances and making them taste like real food. Vani realized the majority of the food she had been eating was processed and had little to no nutrients left in it. The health incident happened 14 years ago and Vani started the blog 4 years ago. The Food Babe Way is all about adopting healthy eating habits. Listen to the show to discover what Vani’s aunt told her cousin about Vani’s new look. Vani says she created the blog because her co-workers and friends asked her to. She explains how she came up with the name. After asking her husband to register the name EatHealthlyLiveForever.com, Vani recalls him saying, “Are you crazy? That’s a horrible name. No one’s going to remember that.” She asked him to come up with something better. A few minutes later, he saw FoodBabe.com was available on auction, and suggested that. 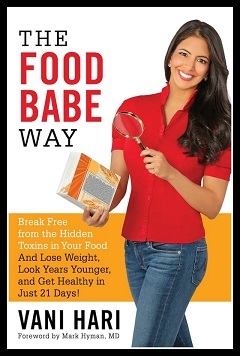 At first Vani didn’t want to call it Food Babe because for most of her life, she was anything but a food babe. She decided she wouldn’t call herself the Food Babe, but would instead teach others to become Food Babes. She didn’t even have a photo of herself on the header of the blog for the first year and a half. The first thing Vani blogged about was eating out while traveling, since she was doing that all the time. She shared one of her salmon recipes and posted a video about a different way to increase your heart rate while doing low-impact exercise on an elliptical. Those are the kinds of things she blogged about in the beginning. Listen to the show to learn how Vani found time to blog. Once Vani realized there were people beyond her friends and family who needed information about what’s in our food, she started to do investigations. Vani wanted to share new, cutting-edge information with her audience, and did research to back it up. One investigation in 2012 was into Chipotle. Although the brand said it was “food with integrity,” they would not publicly release their ingredients. Vani was upset, so she went to every Chipotle location she could drive to and tried to convince employees to show her the back of packages with ingredients, so she could write it down and report it to the public. When Vani released her investigation into Chipotle, and railed at them for not disclosing their ingredients, within a week, someone started a petition on her behalf, which got more than 2,000 signatures. Chipotle’s communication director Chris Arnold reached out to her, apologized and said the company would post the ingredients online. But they wanted to change some of the ingredients first. Listen to the show to discover Vani’s favorite meal at Chipotle. In Vani’s first year of blogging, she had a total of 11,000 visitors. Last year, there were 54 million visitors to the blog. For the first year and a half of the blog, Vani did it part-time, and was making no money on it. Food Babe was purely a passion project. At the end of 2012, Vani quit her corporate job because she felt the food movement needed her more. She put her full attention on the blog and changed the look and the format of it. In the beginning, when people went to FoodBabe.com, they saw three cartoon characters and had no idea who was writing it. The first time Vani revealed herself to her readers was on the header image that’s on her website. Vani had her blog for a year and a half before she revealed herself in this banner to her audience. Within two months, she started a petition to take on one of the largest food corporations in the world: Kraft. Vani’s efforts prevailed. They got Kraft to remove artificial food dyes from Kraft Mac & Cheese. The Kraft campaign put Vani in the media spotlight. She was interviewed by almost every major media outlet, which was both exciting and terrifying. That month, Vani received thousands of letters from parents across the globe who said when they removed all the artificial food dyes from their child’s diet, their child’s health and learning improved, among other things. Listen to the show to learn more about the Kraft story, as well as the double standard for ingredients in Europe versus the United States. Anytime Vani launches a petition, she creates a video to go along with it. The reason, she says, is because people learn differently. Some like reading, others like watching. If you can represent your ideas in a quick video, it can be very powerful. It solidifies your message with viewers and helps people share the information with all age groups. Not everyone will read a 1,000-word blog post or a petition, but they might watch a video. Multimedia platforms are essential in order to get your message across. For example, Vani’s yoga mat video is one that got a lot of views. To show how absurd the amount of chemicals and additives that are being put in our food, and what the applications were outside of food, she thought it would be fun to get on a yoga mat and bite it to make a point. Another benefit to video, Vani explains, is sometimes the media doesn’t even call you to do an interview. They just show your video. They even used the yoga mat video on Good Morning America. Vani says the majority of videos about food are being funded by the food companies themselves. In order to level the playing field, food advocates need to use the medium of video to get the message out in a truthful and upfront way. This Doritos commercial by The Sum of Us, which talks about palm oil, is an excellent example of using video for the cause. Listen to the show to learn more about the benefits of video. In the beginning Vani valued Facebook marketing more than her email list, even though Internet marketers always say an email list has to be top priority. She included “Come and Like my Facebook Fan page” at the end of blog posts to build her following. She also did guest blogging for bigger bloggers. When they shared Vani’s posts, they would mention her Facebook page and people would go like it. Food Babe’s Facebook page has nearly 1 million fans. Vani likes Facebook native video, but she also suggests continuing to post to YouTube, as well. When you write a blog post, you share it on all of your networks. It’s the same thing with video now. If you create a video, post a small clip on Instagram, and then put the full video on Facebook and YouTube. You can even put a Vine video together. Vani’s investigations take weeks to do, so she blogs maybe once or twice a week, usually about four times a month. People need to realize the first time they share something on social media, not everybody sees it. Your audience is not waiting around for your posts because they have busy lives. Reshare your content over and over again. Listen to the show to learn about the legwork that goes into Vani’s investigations. Vani never sought out to be this kind of public figure in the food movement. She says a lot of people want the food system to stay the same, because there’s so much money involved. There are two kinds of critics. Thoughtful critics make you stronger and better as a result of their criticism. There are also critics who are defamatory or want to get famous off of your name or keep the broken food system because they’re benefiting. Those critics are also part of your journey. One of Vani’s favorite phrases, by a Buddhist monk, is: “no mud, no lotus.” Without the struggle, you can’t have progress. You just need to accept that the struggle is going to be there. If you have a message and you know you have to get the information out, don’t be scared. Realize there’s a much bigger mission out there with people behind you. The universe has your back. Listen to the show to discover some of the companies that changed due to Vani’s efforts. Soovle.com is a simple service. Go to the website, type in a phrase or keyword and it will show you what comes up on Google, YouTube, Bing, Yahoo, Wikipedia, Answers.com, eBay, Weather Channel, Netflix and more. Use Soovle to search a bunch of specific sites at once. Soovle is a great tool to use when you’re looking for interesting keywords to use in your blog posts or advertising. It’s also an excellent way to see how the different results look across social channels. For example, I put in “Native Video.” On Google, I got native video advertising examples, native video and native video advertising. On YouTube, I got Native American music and Native American flute. On Yahoo, I got Native Americans and on Bing I got Native foods. So, it’s pretty obvious that Google knows what native video is, but none of the other platforms do. Another use for Soovle is to test what the popular phrases are on the various search engines and see if there’s any consistency. It’s a very cool, easy-to-use service, and what you do with it is up to you. Listen to the show to learn more and let us know how Soovle works for you. The Social Media Marketing Society just opened. It’s a membership community for social media marketers who struggle to keep up with latest in social. If you find yourself overwhelmed and you don’t know what to focus on, the Social Media Marketing Society is for you. It includes three original, tactical training sessions every month and a community of peers who are invested in social. There are very active forums, so people can ask and answer questions, as well as social hangouts for people to get to know each other. There are already more than 1,200 marketers who are part of the society. Enrollment closes at the end of June and won’t reopen until 2016. If you want to get in on the Social Media Marketing Society, visit SMsociety.com and watch the behind-the-scenes tour video to see what it’s like. Connect with Vani on her website and sign up for updates. Read The Food Babe Way. Get recipes, like Vani’s salmon, and other resources on her blog. Check out the Food Babe’s videos on YouTube. Read about Vani’s investigations, such as the ones into Chipotle and Kraft Mac & Cheese. Watch the Doritos commercial by The Sum of Us. Connect with the Food Babe on Facebook. What do you think? What are your thoughts on blogging? Please leave your comments below. 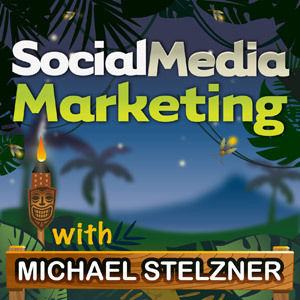 Vani Hari talks with Michael Stelzner about how her blog launched a movement.